1. The machine is specially designed with solid and precise structure; stable, durable and less vibration. 2. Adop the CNC full-automatic computer system control and photoelectric sensors making exact registering without error. 3. Can reduce 4/5 wastes than conventional screen printing machine. 4. The speed of printing is 4 times faster than of conventional screen printing machine. 5. Equipped with electronic counter for counting output quantity. 6. With automatic stopping & warning device for lacking of feeding and improper printing. 7. The squeegee can be used to and for two times or more. 8. 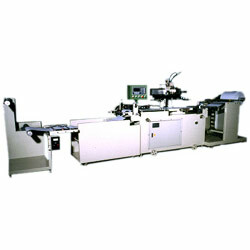 The machine may be adjusted to semi-automatic for printing products of single sheet such as : PC boards, wooden boards etc. 9. Less noise, easy adjustment and operation, labor saving. 2. Area of flat: 35 x 45cm. 6. Specification: 370 x 100 x 170cm.